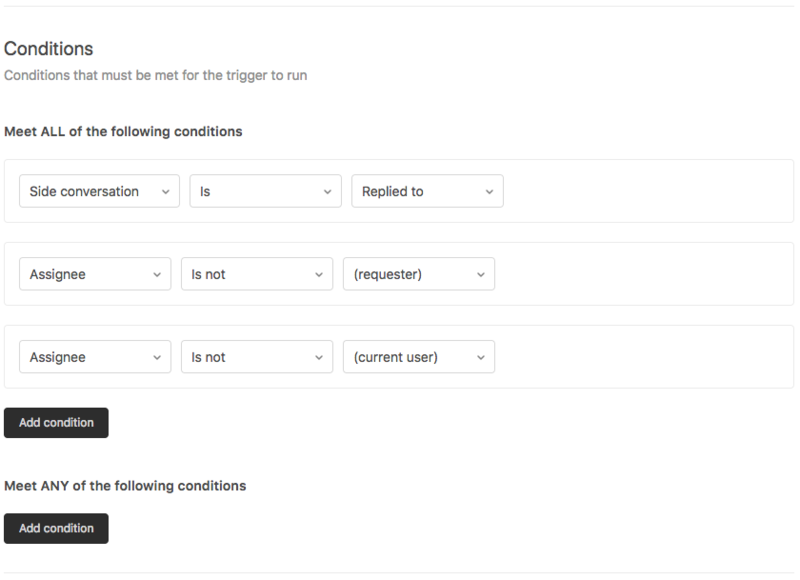 Triggers run, or check conditions, immediately after tickets are created or updated. Any time someone creates, replies to, closes, or reopens a side conversation, they are making a change to the ticket. This means the ticket was updated and so, as a result, triggers run. Note: The Collaboration add-on is required for Side Conversations. For more information about add-ons and light agents, see About add-ons (Professional and Enterprise). The default behavior for side conversations is that the assignee on the ticket doesn’t receive emails, but they do see Growl notifications. 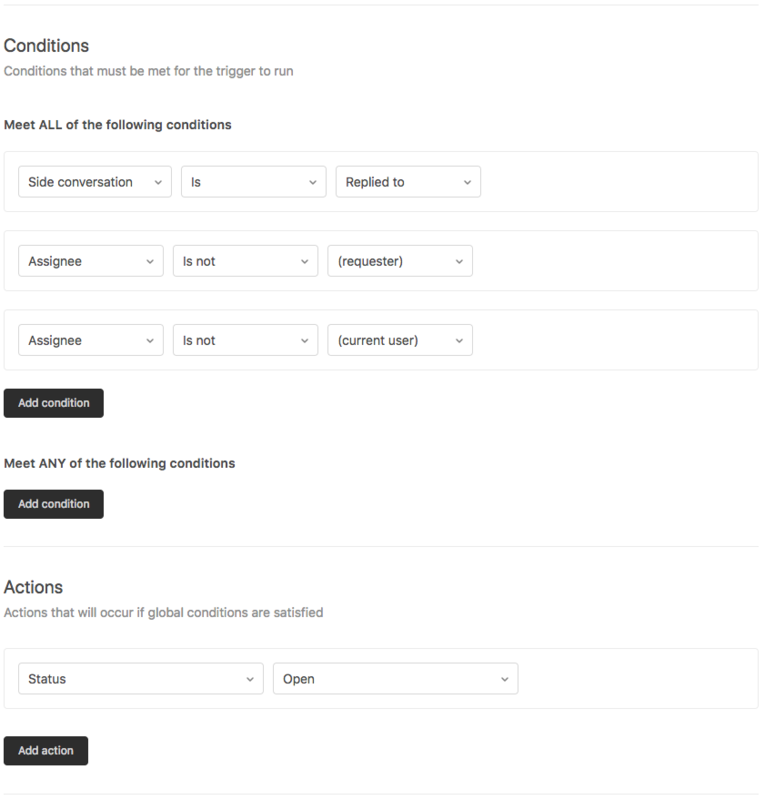 If you want the assignee to get emails about side conversations, you need to use triggers. 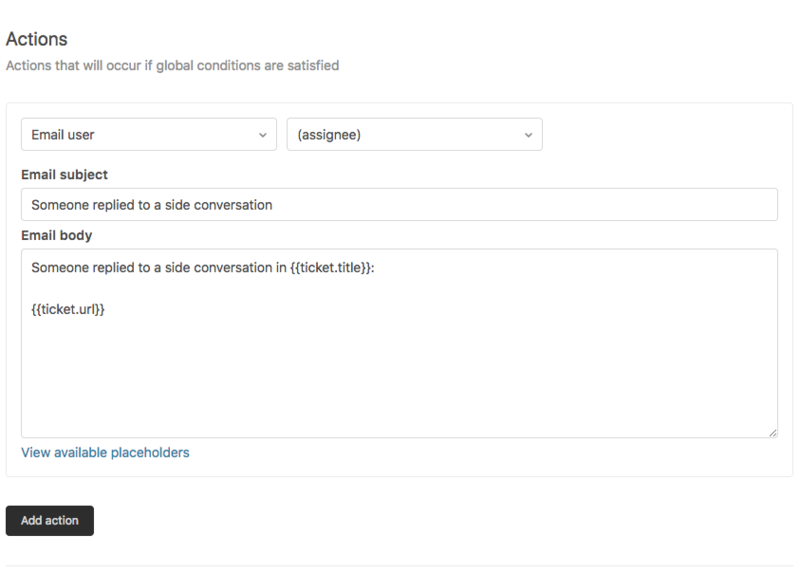 You can create trigger conditions for side conversations so that assignees know when a side conversation is created, closed, replied to, and reopened. Without them, the agent assigned to the ticket (who, ideally, is also the creator of the side conversation) may have a hard time knowing what’s going on with a particular issue. Created is the initial state of a newly created side conversation. Closed is the state of a side conversation after the agent clicks the Mark done button to close the side conversation. Replied to is the state of a side conversation after someone adds a reply. Reopened is the state of a side conversation after the agent clicks the Reopen button to reopen a side conversation. 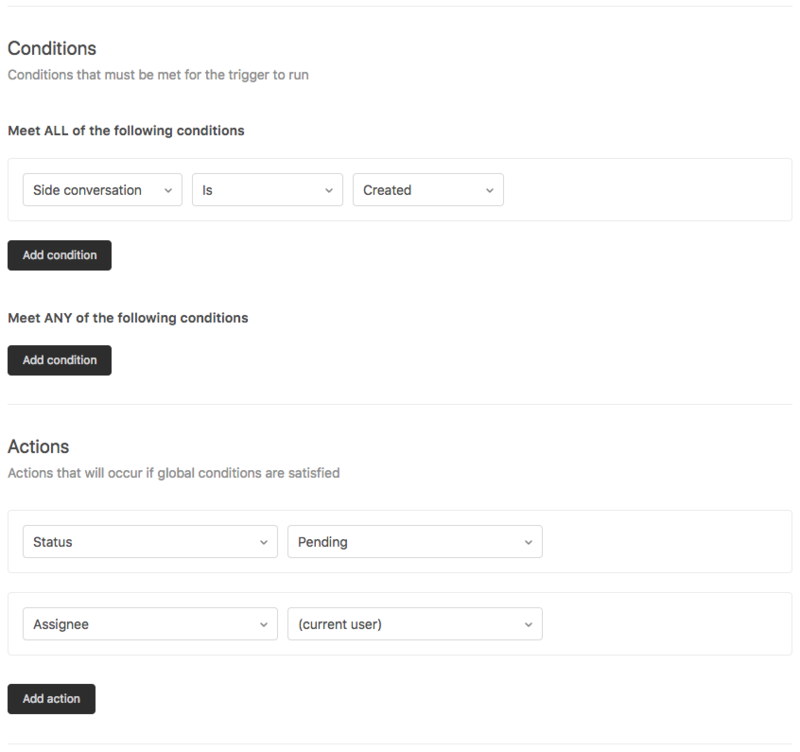 For a complete list of the different conditions and actions that you can use to create triggers, see Trigger conditions and actions reference. Here’s an example of a trigger condition about how to handle side conversations when they are created. Here’s an example about updating ticket status when side conversation replies are replied to. Note: When someone replies to an email notification about side conversation activity, the reply becomes a public reply on the ticket, not a reply to the side conversation. This means that they are replying to everyone on the ticket, including any customers on the ticket, instead of a limited subset of people in a side conversation. For more information, see Viewing and replying to side conversations. Note: When someone replies to an email notification about side conversation activity, the reply becomes a public reply on the ticket, not a reply to the side conversation. This means that they are replying to everyone on the ticket, including any customers on the ticket, instead of a limited subset of people in a side conversation. What does it mean exactly ? If I'm the assignee and I create a side conversation with a user outside Zendesk, he will reply from an e-mail for sure. This reply will become a public comment ? I believe Side Conversations is only for Agents only, so the implication is that they will reply to each other within the Agent Interface and hopefully not email. If you agents tend to reply via email, maybe test out the #private command in the responses and if that works, it should post as a private reply on the ticket not public. However, that sort of defeats the purpose of Side Conversation! I create a side conversation with an external user (for example can be a salesman). When this person reply to the side converstion fron the e.mail received the requester doesn't see the reply. Example 3: The "Viewing and replying to side conversations" link is dead. Thanks for the heads-up, Eckhard! I'll pass this along to our Documentation team so they can get it straightened out. Hi Eckhard. Thanks for pointing this out! I've fixed the link. I get notified when I add a response to my side conversation. Can't seem to find a condition that prevents notifying me (the Agent) when I reply to the recipient of the side conversation. I would like to set up the trigger in Examlpe 2, but I'm a bit confused of what the conditions with the assignees are good for? My first thought was to just have the side conversation condition and then the status action, but now I get unsure wether I need the assignee condition as well. 1) Insights needed: how to measure all things side conversations! 2) Agent experience. Just food for thought about activating/launching new features that have an immediate impact on the agent's experience. If we have have many agents, managing this kind of change can be very tricky if all I'm given as an admin is a checkbox that will immediately show the side conversations button to my agents. Although I can let everyone know about it, understand what it is, how to use it, etc., I can not set my triggers beforehand without activating the feature. 3) If/when SC is inactive. Other tweaks if at any point we suddenly need to deactivate SC. 3.1) The SC button/menu disappears in the ticket interface, and although we can still check past SCs in ticket events, a nice-to-have would be replacing the button with something like "Ticket has side conversations" or something, to ensure the agent reviews 100% of the case. 3.2) If SC is deactivated but someone I emailed via SC replies, the ticket Events seem to update... but there's no way I can see the message the person wrote. Also, trigger conditions disappear completely. We should be able to keep these, regardless of SC being active or not (if not, then it simply wouldn't execute the trigger). Those are my 2 cents... great work, nonetheless, so thank you for a much-needed feature. I have the same question as Jim from July 16th. Is there a way to prevent the trigger from going off when an agent replies to their own side conversation? Also, is there a way to send the message from the side conversation to the assignee's email? "Assignee IS NOT current user"
The problem is: we use side-conversations with our store network (650+ light agents), and they are considered users - yes. So with this setup, any side convo's replies from them - will not trigger... Yes? @Conza with the example in your comment, the trigger will fire if a light agent replies to a side conversation. The trigger in that example will change the state of the ticket when anyone except the ticket assignee replies to a side conversation. Since light agents can't be assigned to tickets their replies would always fire the trigger.